With coupe, hatch, and sedan body styles, the Honda Civic’s swoopy styling has something to offer for everyone. In sedan and coupe models, there’s a choice between 2.0-liter (158hp) or turbo 1.5-liter (174-180hp) engines; the hatch only gets the 1.5. Front-wheel drive is standard, but buyers can opt between a slick-shifting 6-speed manual and a continuously variable transmission (CVT). Sport Touring trim gets 180hp, a 540-watt audio system, centre-mounted dual exhaust, and paddle shifters, but forgoes a manual ‘box completely. Advanced safety systems include road departure mitigation, adaptive cruise control, and front collision avoidance to earn IIHS Top Safety Pick status. 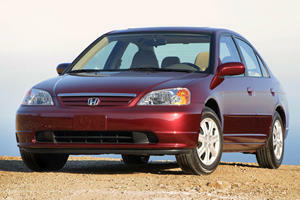 Ten generations of Civic and Honda don’t look like they’ll stop now. It feels like just a couple of years ago that Honda released the 9th gen Civic, and it was only in 2011, making last year’s release of an all new one an incredibly rapid turnaround. The new one ditches traditional hatch styling in favor of a sportback look that allows it to pull off the sedan, coupe, and five-door hatchback trio of body styles with ease. 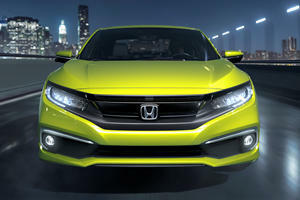 The fresh Civic’s style, technology, and choice between two engines and two transmissions ought to make it a serious contender in segment. The Civic provides ample housing for 5 occupants, but the sleek styling and low slung roof impede rear head room for taller passengers, and make ingress and egress difficult thanks to the low C-pillar. Storage space is commodious – though not class leading – and a wide aperture on all models makes for easy loading. Standard cargo capacity in the trunk sitting at 12.1- 15.1- and 25.7- cubic feet for the coupe, sedan, and hatchback respectively. Interior quality is some of the best in segment, with soft touch materials, a great seating position, comfortable seats, and exceptional visibility. The interior layout is well thought through, though the same can’t be said of the touch screen. The 7-inch system (5in standard) can be a pain to use – especially since Honda has done away with a volume dial, meaning on bumpy roads you’re left prodding away at everything on screen except the volume. The menus are small, and the system seems a little sluggish. The Civic’s basic construction hasn’t actually changed substantially from the 2011-2016 models, meaning the chassis under this new sleek skin is essentially the same. But Honda has refined the suspension, tuning it finely and tweaking bushings and dampers for maximum effect. The result is one of the best, if not the best rides in class. Smooth bump absorption on just about any surface makes the Civic a joy to drive, and the levels of grip are unheard of in this segment – especially for a front-drive car. There’s a playful nature to it though, and a well-tuned stability system doesn’t cut the fun before it starts. The steering inherits the typically non-communicative traits of most EPAS systems, but what it lacks in feel it makes up for in responsiveness. Just off centre, minute tweaks of the wheel yield changes of direction – not sharp enough to feel nervous, but enough to feel alive. Two engine options are simple enough – a base 2.0-liter naturally aspirated 4 cylinder found in sedan and coupe models has outputs of 158 horsepower and 138 lb-ft of torque. 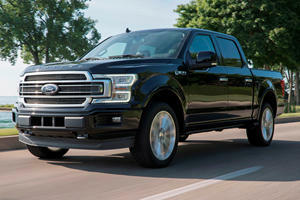 A smaller, turbocharged 1.5-liter can be had in all 3 body styles (standard on the hatch) with 174hp (180hp in Sport models) and 162-, 167- or 177 lb-ft, model and transmission dependant. 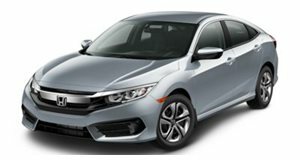 The front wheels are driven via either a continuously variable transmission (CVT) or one of the best 6-speed manuals in the industry – Honda seriously knows how to make a manual ‘box! The Civic comes with a wide range of features and options, though some trim levels are only available with certain transmissions. Want Android Auto and Apple CarPlay? You’ll need the Sport Touring model that doesn’t get a manual transmission at all. Other available features include dual-zone climate control, cruise control, leather upholstery, power adjustable seats, and heated front seats. Safety equipment is generously available on most models, with features including rear-view camera with guidelines, front collision warning, lane departure warning, road departure mitigation, and adaptive cruise control. The 2017 Civic is an IIHS Top Safety Pick, and scored 5 stars from the NHTSA. If you’re looking for a premium hatch, look no further – the Honda Civic combines a stylish exterior with a classy interior and loads of options. Incredibly supple suspension makes it as good a cruiser as it is a driver’s pleasure on twisting roads.